In 2014 the first 100 ships are sailing with LNG as ships fuel. Those are not only LNG tankers. And for the coming years an exponential growth is expected and in 2020 more than 1000 ships will have double fuel system or single LNG fuel system. This blog is looking at some operational safety issues when LNG is considered as ships fuel. The biggest issue is of course the flash point of -188 degrees Celsius.The inland tankers at the Rhine are not allowed to use petrol engines because the flash point is -43 degrees Celsius, still they think that LNG should be considered as fuel. At tankers, we are use to safety zones in the cargo area. At the moment fuel tanks for consumption are not seen as cargo area and there fore there is an lack in regulations. Even the US coastguard doesn’t have regulations yet. Low SOx Sulphur Emissions Control Areas (SECAs). Low NOx, important for upcoming Nitrogen Emissions Control Areas (NECAs). Till now I didn’t see clear calculations about the amount of consumption and kW output of the engine. The price of LNG will be different then MDO or HFO. The above mentioned factors are more often discussed, but I don’t read much about extra operational issues, like break downs due to sensor failure of cracks. At the moment there is not much experience with LNG as fuel for engines on ships. There is experience ashore and on platforms with LNG engines. At sea there is mainly experience with LNG tankers. Those tankers are using the fuel to boil off the cargo ( to keep it cool) and uses this in their boilers. The biggest safety difference between a boiler / turbine and a two stroke engine propelled ship are the extra vibration caused by the slow speed 2-stroke engine. The 4-stroke medium speed engine makes more noise, but the vibrations are less. The extra vibrations from a 2-stroke engine can cause cracking of for example studs and pipes, basically it cracks everything on several points in the engine room. Unfortunately, the vibrations can not be predicted during design. HFO itself is, due to the fact that the flash point is above 60 degrees, not that dangerous. Still with small cracks or loose connections in the supply or return lines, a HFO spray can ignite on the hot spots in an engine room. This is well known in the maritime sector and therefore hot spots should be covered with isolation. With LNG and a flash point of below 60 degrees, this safety issue will remain or even increase. HFO high pressure pipes are also doubled but still there are fires. The 2-stroke engine is seen as a reliable propelling source. Often the failure of the electronics sensors on the main engine are the cause slowdowns and even shutdown. The sensor age is normally reduced by vibration and sometimes heat and water spillage. Well known sensor failure is the exhaust temperature, causing just a slowdown. However the slowdown is normally followed by the shutdown as the shaft generator will trip. Both are for navigational reasons not very welcome. With the LNG as up-coming fuel, the safety issues will probably be handles with sensors which now and then fail, resulting in probably shutting down your fuel supply. 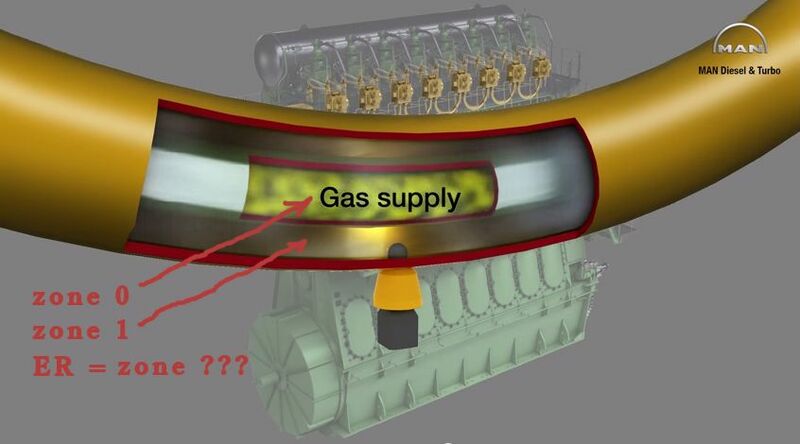 Even if the design means an automatic changeover from LNG to HFO or MDO, at sea the result will probably be the shut-down of the main-engine. A ship with a diesel electrical propelling system like passenger vessels have this problem less. The 4-stroke engines produce less vibrations which reduces the likelihood of sensor failure. Besides that, there are always a few engines running to produce enough electrical power to propel the ship. Shutting down one of those engines, doesn’t have the same impact as shutting down a single main engine. With boilers / turbine propulsion there is almost no vibration in he engine room which results in less sensor failures. Even the change over to MDO during a shut down of the LNG supply will not cause so much problems as the steam production follows a time delay cycles. 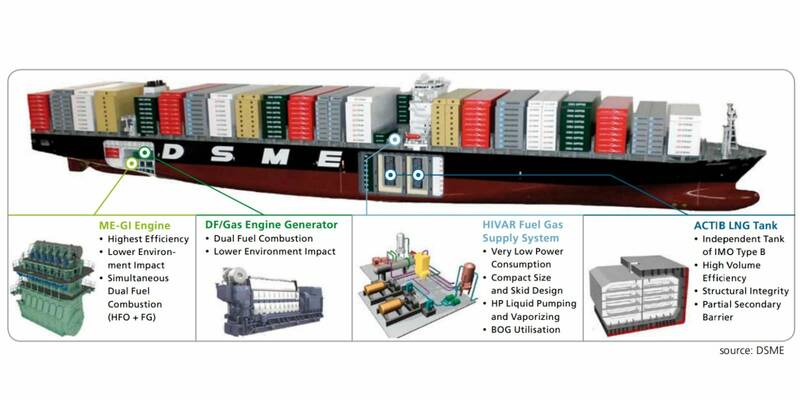 LNG is mainly promoted as a environmental clean option which allow ships in the future to sail in the different ECA’s. While promoting this environmental plus point, engineers are claiming that the ship’s safety and the reliability of the propelling source are not in danger. For the same environmental reasons, the future nuclear powered steam plants on ships are already developed by DSME. New Code of Safety for Ships using Gases or other Low flashpoint Fuels (IGF Code) agreed in draft form by IMO Sub-Committee Sept 2014.